In recent months, all of us who follow Tesla have noticed a dramatic increase in what Elon Musk characterized as “relentlessly negative” news, rumors, and innuendo concerning Tesla and its vehicle lineup. 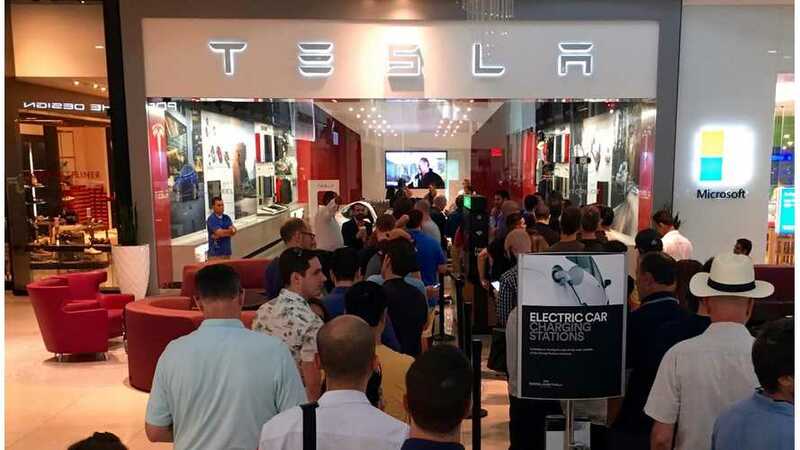 You’ll find damaging Tesla stories and commentary on obscure blogs and twitter feeds, across mainstream news sites and aggregators, and in national web sources and publications. Is It Primarily Short-Sellers Leading The Anti-Tesla Media Crusade? *This article comes to us courtesy of EVANNEX (which also makes aftermarket Tesla accessories). Authored by Roger Pressman. The opinions expressed in these articles are not necessarily our own at InsideEVs. A few years ago Tesla and Elon were the darlings of the media—eco-friendly, tech-savvy, hyper-innovative—the wave of the future. Now, if you were to believe the conventional wisdom as reported by the media, things have changed. Sure, there are still staunch defenders of the company, but the tsunami of news presented with a distinctly negative spin often drowns them out. The big question is why, and the answers I’ve seen are a little naïve and often overly-simplistic. Defenders of the company—and there are many—blame “the shorts” (investors who bet large sums on shorting TSLA in the hope that stock prices will fall) or “big oil” or “big auto”, recognizing that Tesla’s success represents a significant long-term threat to all of those constituencies. Attkisson is writing about a long-time practice of shady political operatives (on both sides of the aisle) working to manipulate the news. Yet regardless of politics, political beliefs, or controversy surrounding the book, it's clear her comments are equally germane in the case of Tesla. I suspect that the smear we’re witnessing is a disinformation campaign conducted by professional smear shops who are experts at manipulating friendly members of the media and through them, the general public. And behind the smear shops, hidden from view, are paying clients who desire anonymity. But what are the explicit characteristics of a “smear,” and how can you learn to recognize them? As important, how do the shadowy figures who operate professional smear shops do their work? Tesla was in “production hell” as Model 3 ramped (factually true), so with that reality, the smear emphasizes production line failures, overworked employees, unsafe working conditions, and the like. Early Model 3 vehicles did have fit and finish issues (factually true), so the smear suggests that all Models 3s continue to have quality issues and that maintenance costs will skyrocket for consumers. Lots of major auto companies have announced EVs that are supposedly competitive with Tesla vehicles (factually true), so it’s possible to spin those industry press releases into a smear that suggest that a “Tesla-Killer” lies ahead and that it represents an existential threat to Tesla. Capital outlays for the production ramp and the Gigafactory have been significant (factually true), so with that reality, it’s possible to spin hundreds of stories into a smear that suggests a cash burn that will lead to Tesla’s financial Armageddon. Professional smear shops hire enthusiastic young college grads and plenty of unpaid interns who follow the target of the smear—Tesla—24/7. Every news story, every social media post, every rumor no matter how insignificant or untrue, is logged. Every tweet and every public comment made by Elon Musk is dissected to find a way to spin it negatively, preferably questioning Musk’s mental stability, his character, and his honesty. This stream of information goes to copywriters who formulate releases that are passed on to “friendly journalists” who, as Attkisson notes, gain something for promoting them. Much of this can be accomplished using social media as a driver. In fact, professional smear shops increasingly use a combination of bots and boiler rooms of paid employees to troll social media in ways that amplify the smear. Attkisson notes that the targets of the smear—in this case Tesla and Elon Musk—are chosen because "because that person is seen as damaging to the interests of the people that are perpetuating the smear." The smear also ramps up when the target is about to accomplish something that threatens those who pay for the smear. It’s no coincidence that the launch of Model 3 and the tsunami of negative press occurred in the same time period. But when a smear is in play, it doesn’t stop with negative news stories. If smear professionals are at work (and I believe they are in this case) they go beyond negative stories to attack any person or story that presents a positive spin. A recent example is the story of automotive journalist, Dan Neil of The Wall Street Journal. Neil was viciously attacked by Twitter trolls who questioned his ethics after a glowing review of the new Tesla Model 3 Dual Motor Performance Model. It’s important to note that personal attacks and character assassination are hallmarks of a coordinated smear campaign. In fact, there’s even more to it than that. In a professionally coordinated smear, the attacks against journalists like Neil and others become the story and drown out the positive news that was originally published. If Neil’s ethics are questioned over and over again by trolls who claim bias or worse, those who coordinate the smear know that the positive elements of the original review that Neil wrote will be discounted by many. As ugly and dishonest as it is, the smear works … and whether we like it or not, it’s now working against Tesla. Attkisson describes smear professionals in the following way: "The smear business is interminable and eminently profitable. It’s silently turned into one of the largest white-collar industries in Washington, D.C. . It’s making thousands of people rich. It’s becoming one of our biggest global exports." As I’ve already mentioned, the smear business works with sophisticated and moneyed clients who almost always hide behind large law firms who themselves use cutouts to make it extremely difficult to determine who is behind the smear. The client remains invisible while the goal is always the same—to use every means available to cripple the reputation and impugn the product of an adversary. And when the paying client or the smear shop is confronted with circumstantial evidence of involvement in the smear, Attkisson describes their response: “Admit nothing. Deny everything. Demand proof. Make counter allegations. Discredit the accuser.” And therein lies the problem—it’s extremely difficult to prove that a smear is happening, even when every shred of evidence indicates that it is. And who is behind all of this? Who are the “clients”? The obvious suspects are the same ones I mentioned at the top of this post—the shorts, big oil, and specific companies within big auto (luxury car brands come to mind, since Tesla has eroded their market share). But other possibilities could be entities that are threatened by Tesla’s business model (e.g., automobile dealer associations) or Tesla’s leadership in autonomous vehicles. The structure of the smear industry makes them all invisible, and that’s a major part of its allure. State that a coordinated smear is happening; that it isn’t coincidence or grassroots commentary; that professionals are involved, and that the proof is in the similarity and intensity of the negative stories. Provide examples of negative stories that are provably untrue or misleading. Emphasize that a double standard is in play—do other automobile companies get the same treatment when, say, one of their vehicles is involved in a car fire? Note the coincidental timing of the smear and Tesla’s accomplishments—in this case, the release of a revolutionary EV (the Model 3). Note further that many entities are justifiably threatened by Tesla’s many accomplishments and imply that there is reason to believe that one or more of them are funding the smear (even better, apply investigative resources to prove it!). Recommend that readers exhibit strong skepticism when they encounter negative press about Tesla, asking whether the stories omit facts, lack context, or are purposely misleading. Refute all blatantly false reporting or claims. At the end of the day, the smear is all about the weaponization of social and mainstream media in a blatant effort to annihilate an opponent. The sad reality is that it often works. Let’s hope that’s not the case for Tesla.